Had a couple hours to spare this morning so decided to prep my dinner while I made breakfast! Preheat oven to 170 degrees C / 340 F / gas mark 3.5. Arrange the sweet potato on a baking sheet and drizzle with olive oil. Bake for 20 minutes until tender. Leave the oven on after. Beat the eggs in a large bowl and add the sweet potato slices, red pepper , dill and pinch of salt. Grease an oven proof frying pan and heat over a low heat. Add the egg mixture to the pan and cook, loosening the edges every 30 seconds with a spatula. When the eggs have set about 5mm from the edge of the pan transfer to the oven and cook for 15 – 20 minutes. to test whether the omelette is cooked, press the top with a palette knife – no egg should ooze out. Serve warm or cold with a mixed leaf salad! 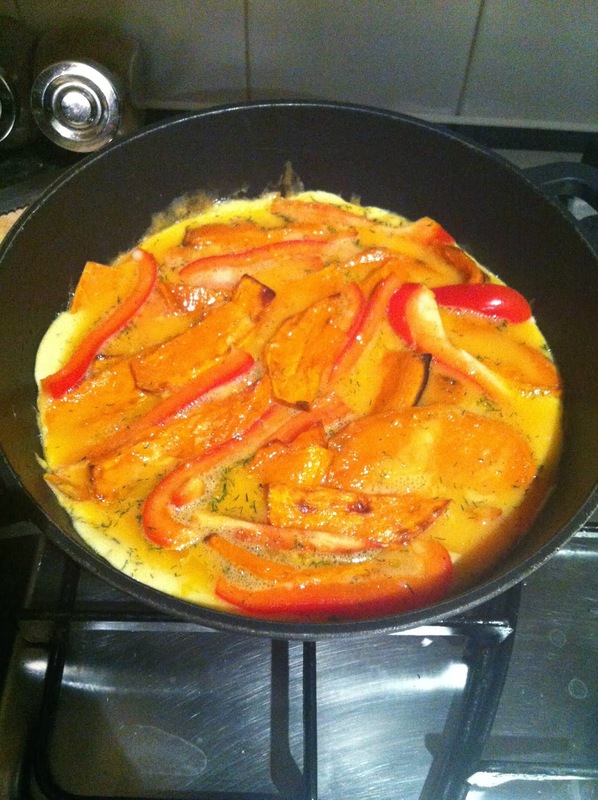 Let me know if you try this Spanish Omelette recipe and what you think! The taste test for me is tonight! Yum! I grew up eating traditional spanish omelets, so this looks amazing. I'm not sure about the dill, I'm not a big fan.